Today’s thriving enterprises recognize the value of content and the role it plays in the customer experience. 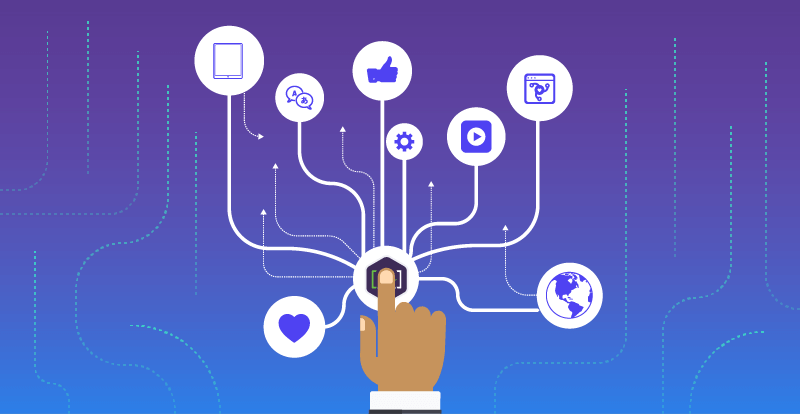 Consumers now expect highly relevant, timely, personalized content at all touchpoints of the customer journey, on any device or interface, across any and all channels of their choosing. Organizations that successfully deliver on these expectations reap the financial rewards and become leaders in their industries, while those that do not struggle to keep up with the rapid rate of change we all see around us. Content constantly evolves, driven by consumer demands and needs, and the channels for delivery are seemingly endless. User interfaces long ago leapt beyond traditional screen-driven interactions. Today, we have conversational UIs like chatbots, voice search and voice command, automated content interactions, and rich interactive content in the form of virtual reality, wearables, and the larger world of content everywhere. Content formats range from microcontent to videos and podcasts, to apps, email, mobile push notifications and wikis. Truly personalized customer experiences tailored to the individual are now also possible thanks to an increasingly sophisticated understanding of customer context, in the form of customer data platforms that combine customer signals into a store of big data, harnessed through machine learning. They reduce the amount of effort required to find and act on information and manage transactions. They save time and blur the barriers between humans and devices. They make the overall digital experience more inviting, appealing, and entertaining. They enable us to automate time-consuming and costly tasks. They help create a more consistent brand presence across multiple channels. They build more detailed customer profiles for improved targeting and messaging across sales and support journeys. Progress is not without its challenges. Marcomm and Techcomm teams are now confronting the complexities of content integration across platforms (an alphabet soup including CCMS, CMS, DAM, CEM, CRM, and ERP), and it is important that we find a way to ensure a smooth content distribution and process powered throughout the disparate systems. Marcomm and Techcomm each address structure in their own ways and have historically taken different but similar approaches to naming, labeling, managing, and reusing content. While Marcomm is moving into customer experience management platforms, such as Sitecore and Kentico (weaving together content strategy, structured content for web content, schema.org, Open Graph, and other public markup schemas), Techcomm has developed and defined components of structured content types in the form of DITA (Darwin Information Typing Architecture, an XML-based open standard for structuring, developing, managing, and publishing content). Similar to Marcomm’s structured content models, DITA separates content into topics allowing reuse across numerous contexts and scenarios with applications both in digital and print environments. Both Marcomm and Techcomm deal with structured content, and although they do so in different ways, they both ultimately strive to make information more useful and accessible to users. Thus, we all face the same big challenges when creating, distributing, and reusing content. We are charged with the task of creating intelligent content that is future-ready to serve the demands of new and yet unimagined interactive channels. Today, most companies, organizations and institutions struggle to keep up with content demands and expectations. Consider the sheer volume of information that must be distributed across large populations, numerous industries and multiple channels — for healthcare providers, schools and higher education, government, financial services and nonprofits, to name a few — that’s a lot of content! Unfortunately, rather than tackle the content challenges that create friction within our organizations head-on, we instead employ short-term solutions that result in higher costs and wasted time in the long run. Working towards leaner, smarter processes that take advantage of things like automation and customer experience (CX) platforms helps eliminate these costly barriers. Pre-sales, marketing, and post-sales content need to work together to build the best possible customer experience to ensure growth and customer retention. Structured content, combined with semantics to become intelligent content, adds order to content in consistent and predictable ways that enables machines to work with it in ways that optimize the human value of the content. When content is structured and enriched with metadata, it can be transformed, reused, and adapted for many different “views,” also known as renderings or presentations, that interact with customers. A Master Content Model™ (MCM) ties everything together by defining the relationships between content types and elements across systems, variants, and channels. It also defines the content entities and their relationships. The MCM is both a tactical store of structural norms and a strategic synthesis of the knowledge domain of the content itself. An MCM is one schema to rule them all within an enterprise. At [A], we have seen the MCM create enterprise value during its creation as well. It creates a meeting point for collaboration. Joe Gollner, a pioneer in the field of engineering content, has worked with [A] to use the MCM as a framework to combine approaches from techcomm and marcomm into coherent application. The existence and application of an MCM significantly reduces the friction often experienced in creating, managing and publishing content. A content model should specify the technical, functional, and layout requirements of each element, such as how many character limits or rules for elements, field types, validation logic for each element, mappings to schema.org and other standards, and so on. By representing publishing variants for elements, it should also define opportunities to dynamically connect and reuse content. In essence, comprehensive content modeling injects static content with enough technical intelligence to make it interactive and dynamic. This process can then be used in applications like chatbots, IoT (Internet of Things) devices and voice-controlled AI assistants. The MCM simplifies the development of content tools, apps, and APIs. Even further, if paired with the context provided by a CX database, content can be largely automated and used to generate real-time personalization, tailored email campaigns and more. Structuring content within a well-defined content model makes content scalable, reusable, adaptable and measurable. A unified MCM fortifies content by making it “technology-proof”—no matter what new social media platform, trendy wearable or mobile device comes out next, structured content is already equipped to handle it. The subject domains, ideally organized into an integrated domain model, embodying the semantic representations applied to knowledge assets. An inventory of the existing content types. An identification of planned or envisioned content types (including potential enhancements on currently existing content types), such as will be needed to support new information products. The current and desired customer journeys if available, as an optional input used to reality-test models against a customer lifecycle. Current and planned system, process diagrams, and documentation. Data models / template definitions for current and planned content-supporting systems. The current and planned output formats and structures. Representative examples of existing content artifacts including source MS Word documents, data exports from authoring/management environments and output publications such as the rendered web pages and printed brochures (PDF). Content that does not generate value is a waste of time and money. It has a one-time cost of creation, but in order to continually grow its return on investment, it must generate positive impressions and interactions with humans and robots. As content assets grow impressions, they decrease their effective cost. Content can be valued; this is called content valuation and this is the lynchpin of making our content an asset and not an expense. Structured content and content modeling give our content assets the power to decrease effective costs while reaching the right audience at the right time with relevant content interactions. It is this velocity of content throughput and distribution that increases return on investment for pre-sales OR post-sales content. Leveraging an MCM does not mean that all content must be in a single content repository, nor does it require having a single authoring environment. An MCM means having one master framework that organizes the structure of our content in all the authoring systems and repositories across an enterprise function (or a whole enterprise!). Best of all, it’s not necessary to model every domain or to tackle all content at once; our organizations are too large and too complex to reasonably achieve a normalized content structure quickly. Instead, we start with a small, manageable piece and expand from there. For example, start with defining one specific outcome that would add value to your business—a personalization scenario, an integration point, or customer journey. Create a model specifically tailored for that outcome, and then align authoring systems to achieve the desired results. The most difficult aspect of a structured content initiative is the organizational change. That’s why [A]Ⓡ has built a practice that specializes in strategically building structured content, content engineering disciplines, and content models and related publishing processes into organizations. But, the know-how cannot be outsourced forever. Enterprise leaders need to start building internally-driven content intelligence capabilities to manage content structure and semantics across the publishing lifecycle, and align technology and delivery. The future of content is here. Our organizations need a new content order internally to meet a multi-channel, multi-model world head on. Content Engineer and founder of [A], Cruce Saunders (@mrcruce) writes and speaks regularly on intelligent content systems and the evolution of content technology. To learn more about the Master Content Model™, watch Cruce’s keynote, “Evolving the New Content Order”, delivered at LavaCon 2017. Editor's Note: This article was first published in Intercom in January/Febuary 2018 by the Society for Technical Communication. Links in above content are original to this post. Learn how to construct, implement, and manage a Master Content Model™ for any complex content ecosystem.